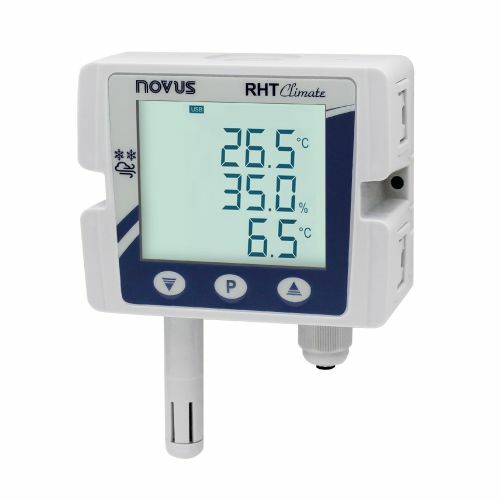 Novus Automation has released the RHT Climate, their new Temperature and Relative Humidity product family that is designed to meet the most demanding applications in terms of accuracy, versatility and psychrometric information. Equipped with one of the most accurate sensors on the market, its measured variables can be retransmitted through two analog outputs, which can be configured by software to either current (4-20mA) or voltage (0-10V). The output can also be read by Modbus RTU through RS-485. The transmitter also has two digital outputs and a buzzer that can be used as alarms with a configurable set point. The parameters can be adjusted through the built-in HMI or by a simple USB cable using their free configuration software. The free software also allows you to save the desired configuration for future use.